In this video I will teach you how to play including: Setup, Player turn, player actions, end game conditions, and scoring. I will also give you my thoughts and opinions on the game, and would love to hear yours. In order to keep things as spoiler free as possible, I’ll just give a general overview of what’s new the expansion, and limit photos to what’s in the first sealed box. Much like the base game, the expansion comes with four boxes to open over the course of four games. 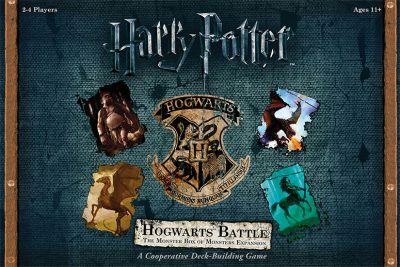 To go along with the 4 characters from the core box, players can now use Luna Lovegood as their hero. She has a base power that heals someone the first time she draws extra cards. The expansion also includes a new power for each of the other heroes. 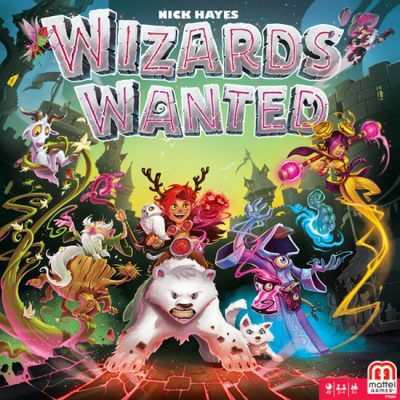 Each player takes a wizard player board which grants the player one of four charms (in four separate colors). These charms give bonus money and fame to players as they complete spell jobs at village locations on the board. The player board also has a space for a player’s pixie dust which powers spells and extra movement. 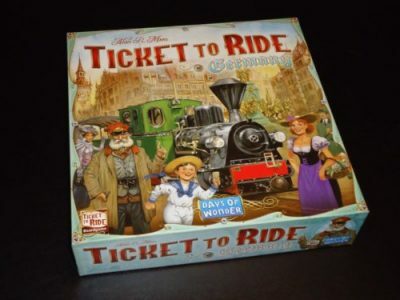 Each turn, players choose how far they will move and whether or not they will take an action. Moving a higher number of spaces costs more pixie dust. In addition, a player can use multiple teleportation type spaces to zip around the map. This is important because budgeting pixie dust for movement vs completing spell jobs is an important calculation in the game. 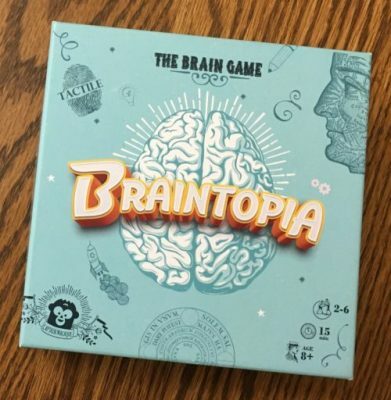 Braintopia puts your mental synapses to the test. The goal is to recognize patterns, memorize images, solve puzzles or otherwise use your brain faster than the other players. One card at a time. It’s basically cerebral Slapjack. The rules are simple. Flip over one card from the deck. Players try to deduce the card’s answer based on its category. If you think you’ve solved it, slap it with your hand and leave it covered. The one with the quickest reflexes gets to announce the solution. Correct answers win the card. Guess poorly, and you sit out the next round. Collect two cards to earn a brain token. Gather four brains to win the game. 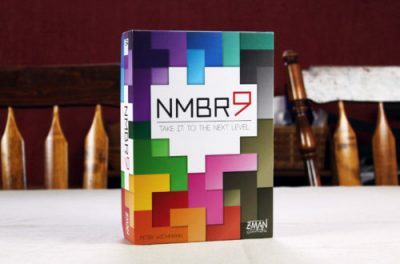 NMBR 9 is all about stacking tiles as high as possible to maximize your points, and it’s not as easy as you might think. Here’s how it works. From a single deck of cards holding 2 copies of each of the numbers 0 – 9, a card is flipped over. Everyone takes the tile represented on the card and adds it to their own personal stack of tiles, with just a few restrictions. In Barbarians: The Invasion, you control a barbarian clan and lead it on its path to glory. Place your champions on the 3D Volcano to gather resources, construct buildings, pray to gods, and lead your troops in fierce battles to conquer the most regions and become the greatest clan of all time. 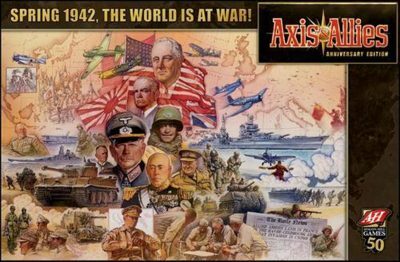 The world struggles in the Cold War, and many see the sky as the next battlefield. The era of Space Race has just begun. Do you have what it takes to lead a daring space agency into a new age of human achievement? 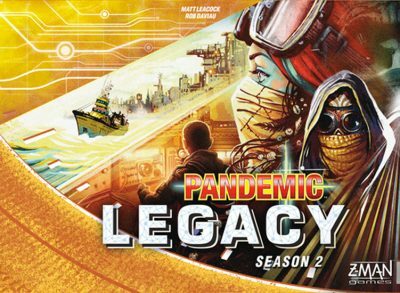 Space Race takes place during the first seven decades of the space conquest, and players become directors of newly established Space Agencies. Their goal is to expand them and to achieve astonishing breakthroughs. During the game, players will develop their Space Agencies by acquiring various cards (engineers, technologies, space programs) from a shared pool of cards called Universe.